Lost in the Movies (formerly The Dancing Image): Twin Peaks: The Return Part 6 - "Don't die." Well, can you blame me? I imagine a lot of people are going to top their recaps or reviews with this picture tonight and tomorrow. This moment was the closest part 6 came to fan service - for three weeks, viewers have been predicting that "I know where she drinks" referred to Diane, and that Diane would be played by Laura Dern (although I don't think anyone predicted she'd be sporting that very Lynchian wig). The scene unfolds with fairly conventional buildup and payoff (Albert speaking her name) with a cute nod to Diane's forty hours of masked identity, as she is identified by the back of her head before finally turning around for the camera. It's a lot of fun, and I can't wait to see how her character develops, but this very brief bit is entirely unrepresentative of the rest of "Don't die." It's also something we all saw coming. As such, it's not very typical of Twin Peaks: The Return, or perhaps especially of part 6. I predict this will be one of the more frustrating and alienating episodes for many viewers, but while it didn't do as much for me as part 5, I liked it (probably more than part 4). Parts of it made me uncomfortable, but in interesting ways. It also helps that I'm sold on the Dougie/Coop scenario - but we'll get to that momentarily. After all, why rush? The Return certainly isn't. Unlike last week, but not quite as much as, say, part 3, this feels less like a self-contained TV episode and more like taking a slice out of an early section of Mulholland Drive. Its opening is guaranteed to drive at least half the audience mad - how many times can predictions that we're just around the corner from "Cooper's back!" be proven wrong? And the ending is, to quote the Arm's doppelganger, nonexistent: the dispatcher and Chad, the rude deputy, have an unpleasant conversation before we cut to a random nighttime shot of the Road House and listen to the closing band. This is definitely the limpest conclusion yet. In between, two moments of shocking violence (in which the episode title's command is gratuitously violated) stand out, as does a lengthy exchange between Richard Horne, the local drug dealer who terrorized the teenage girl at the Road House last week, and Red, the guy who pointed at Shelly near the end of the first two hours (played by Lost Highway star Balthazar Getty). Red threatens Richard with typical intimidation and condescension, but also more arresting surreal gestures, like his constant fascination with his hand. Most notably, Red demonstrates a bizarre magic trick with a dime that seems to spin in the air and end up inside Richard's throat, before transporting back into Red's hand like a certain clump of garmonbozia in the original Twin Peaks. Considering how long we spend with Dougie - a full twenty minutes of very slow progress, in which the payoff seems to be (wait for it!) his exposure of insurance fraud by sketching all over his case files - it's a bit surprising how much crucial action takes place in Twin Peaks this week. There are several heartening moments where we are re-introduced to familiar faces. Heidi, the giggling German waitress whom Lynch always brings back (she's even in Fire Walk With Me, where he cut most of the cast) chats with an equally cheerful customer who looks like she could be Heidi's daughter; for a moment I thought she was Heidi. More substantially, Harry Dean Stanton returns as Carl Rodd, curator of the "New" and far less photogenically dumpy Fat Trout Trailer Park (relocated to Twin Peaks from Deer Meadow, apparently). Stanton's name was one I was most excited to see, and here he delivers a surprisingly touching turn as an old man confronted not with his own death, but that of a child (run over - naturally - by Richard, who is far and away the most loathsome person in Twin Peaks). As he gazes at this pieta, in which a grieving mother holds her limp little boy with his legs dragging behind him rather than folded over her arms (a surprisingly effective choice by Lynch), Carl notices a green shape float up from the site and disperse among the electric wires overhead. The original Twin Peaks did this certain thing with tone - especially when depicting grief - that I haven't seen The Return do too much. A few of the performances have been pitched toward that certain is-it-over-the-top? mark (think the sharply stilted dialogue of Tracy and Sam, or the blistering wifely wrath of Mrs. Hastings and Mrs. Truman), but there hasn't been much music, and few of the situations have been overtly melodramatic. The aftermath of the traffic accident is the first scene to pick up all these elements, and I can't stop thinking about it. For some reason, the moment doesn't feel like it's intended to sound a particularly naturalistic note. But I can't quite put my finger on what that reason is. Each individual reaction seems earnest, certainly not overwrought given the situation; none of the performances look cartoonish in isolation. Perhaps because of the way Lynch lingers on them or keeps cutting back to them or couples them with the sentimental score, I found the scene unusually jarring. I realize it's going to be subjective, but personally I was not simply wrapped up in the moment the way I would be in, say, Fire Walk With Me (this scene is much closer to the pilot for me, in which I regard Laura's parents' grief as a curious outsider rather than a direct participant). The scenario, and the execution, dwell on the shock and sadness of the moment, yet they also carry connotations of hokiness. There are times during these couple minutes where I instinctively thought, terrible as this sounds, "Is this funny?" Or, its twin: "Is this bad?" 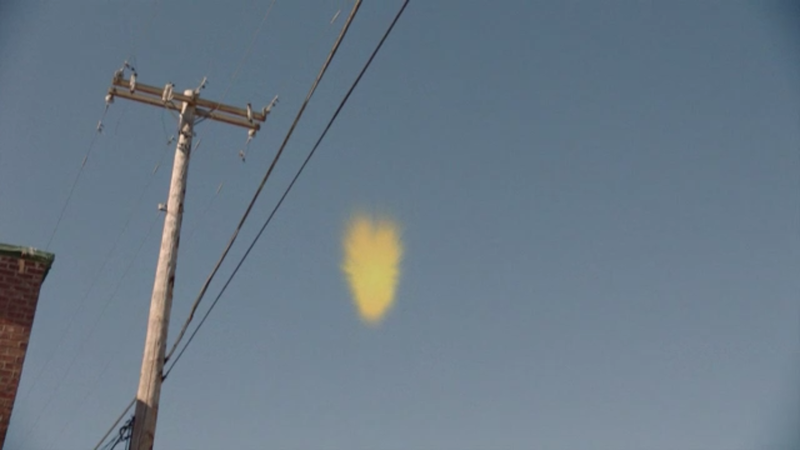 In his review of the pilot, Jonathan Rosenbaum wrote, "A similarly fresh and alien quality was apparent in the grief the adults of Twin Peaks displayed after the discovery of Laura's body. The tears of the sheriff's deputy, both of Laura's parents, and the high school principal are lingered over with a kind of numb, abnormal curiosity that suspends the narrative well past the point of conventional movies, much less soap opera. ... [T]he wailing grownups are converted more into slightly uncanny art objects, regarded with the same kind of inquisitiveness that a thirteen-year-old might have about, say, an exotic beetle." This may say more about Rosenbaum's perspective than Lynch's, but I suspect a lot of viewers, myself included, are closer to seeing this like the critic than like the director. We seem to be less in the emotional intensity of Mulholland Drive's or Fire Walk With Me's back halves than in the deadpan campiness of Blue Velvet's suburban scenes (indeed, it's as if Frank Booth's car careened through the picturebook crosswalk in that film's opening credits) or, for that matter, much of early Twin Peaks. There is a distance there for me, but there are also pathos. The more I sit with my reaction, reflecting back on the scene and its strange effect, the more I think, "No, this isn't really funny at all, and it's probably good, in an unusual way." Yet I can't quite explain that feeling either! Besides the inherent horror of the scene shining through, there was something moving about the potential vulgarity of its presentation: flat lighting (or what I perceived as such), the aforementioned music, the lingering on a situation which is theoretically pretty hackneyed (what easier way to manipulate an audience than suddenly killing a child introduced moments earlier for that very purpose)? And yet if it didn't quite feel real, neither did it feel false. It reminded me quite a lot of Roberto Rossellini, in fact - which is odd since the Italian neorealist was so vocally anti-melodramatic while this scene's style is unabashedly melodramatic. Nonetheless, in both cases there is a rugged, almost childlike approach to the direction which casts aside concerns about good taste in order to present a situation straight from the heart. Rosselini is a director who has challenged me greatly, but which I have slowly found more rewarding over time. Two more aspects power this scene: Stanton's reaction, totally in sync with the overall mood but also carrying the weight of time and our familiarity with him - and the touching naivete of the quietly glowing green shape rising from the boy's body, like something out of a medieval fresco: the soul as a very vaguely anthropomorphic abstraction. I expect this incident will only grow and develop more shades as I revisit it. I'm less certain about the other notable outburst of violence, when a very short, muscular assassin rushes into an office building and stabs the woman who called Argentina at the beginning of part 5. Ok, terribleness be damned, I was definitely laughing at the beginning of this scene. The overlaid hip-hop track, already amusingly unusual for Lynch, brings with it the memory of this woman's off-kilter performance in that earlier scene - plus the strangeness of the whole scenario was as hilarious to me as it was alarming. But the hilarity faded fast, my grin turning into a cringe as Lynch dwells on the brutal butchery of the woman in close-up. The attack on her random co-worker, a demure older woman who appears to be nothing more than an innocent passerby, occurs offscreen but somehow feels even more vicious. The mayhem is capped with explicit dark humor as the little man frowns over his mutilated murder weapon. Possibly this scene can be valued for the way it confuses our reactions, but I don't think I'm misreading to conclude the overall mood is horror-comedy. The misanthropy feels a little cheap, and I'm not sure whether it's courageously self-aware or indifferently self-defeating for Lynch to include it in such close proximity to a more earnest depiction of death (it even makes one question anew whether that earlier scene was supposed to be somewhat sarcastic). Why does one life matter while the others are simply laughed off? Should we thank Lynch for drawing our attention to this discrepancy or conclude that he himself holds a double standard? Is "or" even the right conjunction here? This sequence reminds me a lot of the bungling hitman in Mulholland Drive, in which the comedy is heightened and the violence is dampened so that both are less troubling. Furthermore, that film's whimsical carnage is contained within a section that is both tonally and narratively implied to be...well, call it what you will: a fantasy, a dream, an alternate reality with less emotional weight. Likewise, is this hitman's attack also part of a "less-real" reality? He belongs to the Dougie world, and others (including Em on the podcast Sparkwood & 21) have already speculated that Cooper emerged into a kind of fabricated dream world, perhaps one that exists inside the doppelganger's consciousness. The Las Vegas action, this theory goes, is basically the "Betty Elms" reality while the rest of what we see is taking place in the "Diane Selwyn" reality; we're watching a Mulholland Drive in which the two sections are intercut rather than placed back-to-back. There are plenty of indications for this: multiple references to dreams (including, in this part, the one-armed man's direct incantation that Cooper "wake up! "), the transparent absurdity of everyone shuffling "Dougie" through his daily life with little concern for his obvious condition, and Naomi Watts herself is present as a kind of metatextual clue (playing much closer to her Betty performance style than the rawer Diane). On the other hand, as I've already indicated, much of the non-Vegas/Dougie material in The Return is also pitched at this level. In this part alone, in addition to soapy, archetypal presentation of the dead child, there are several references to soldiers/war whose on-the-nose topicality feels slightly shoehorned in, the bad guys are very bad (both Richard and Chad are unremittingly despicable), and there's an unreality to Red's interaction with Richard which can't just be explained away by drugs. We know that, much as Lynch enjoys this affect, he is capable of other moods and styles. If he wanted to contrast a more heightened reality with a more down-to-earth one he could, but he isn't really doing that here. Something slightly different is probably going on and I doubt we'll know anytime soon. Which finally brings us to Dougie. Despite the attention given these other characters and storylines. Cooper remains the dominant star of this new Twin Peaks. Which is what everyone wanted, right? Oh, but not like this... Indeed, we pick up exactly where we left off during the credits of part 5, even with the same music cue. Having hit upon two great tracks last week - BluntedBeatz's "I Am (Old School Hip Hop Beat)" and Johnny Jewel's "Windswept" - Lynch essentially decides to drive them into the ground this week! Although I still found the music effective, this is one more element to tweak those desiring forward momentum. For those who aren't feeling it, the Dougie plot must just seem like one long troll. As I tweeted last week, "When will Cooper be back?" is becoming the new "Who killed Laura Palmer?" in both its importance to the narrative and the impatience of its inquisitors. Just as solving the Laura mystery spelled the end of Twin Peaks' narrative drive in 1990, resolving Cooper's identity crisis would do the same in 2017. This is the hook of The Return, and the moment the FBI agent is in full command of his faculties again the story is over. I'm not even totally sure he will ever "be back" in the sense people seem to want, but if and when this occurs, it's curtains (pardon the pun). Does this mean he will continue in the barely verbal, stumbling "Dougie" state for all twelve of the remaining hours? No, not necessarily. But the idea that this is just a temporary tease before Lynch and Frost deliver the goods fundamentally misunderstands what they're getting from it (and what we could be too). And it also misunderstands what, fundamentally, Cooper consists of. We all fell in love with the character at least partly because of his intelligence, humor, charm, and command. He was the perfect mix of boyish enthusiasm and mature control. "Dougie" has little to none of these qualities. And yet - he's curious. He's kind (notice how he interacts with Sonny Jim and even Janey-E when she offers the occasional warm gesture; this version of Dougie is not just some zombie). He has an inner life, however difficult it is for him to express this, however diffused among responses to outer stimuli. A person does not cease to be themselves when they become incapacitated. We are not our strengths - or our weaknesses. There's something that goes deeper: this is Cooper. Lately I've been reading One Saliva Bubble, an unproduced Lynch/Frost screenplay from the late eighties. This wacky comedy takes as its premise a satellite-generated burst of electricity which zaps a Midwestern town and swaps all of the citizens so that their minds are trapped in the wrong bodies. This results in an entire community of Dougies - men and women who aren't at home in their physical forms, stumbling through lives they barely understand. Even before this turning point in the story, several characters are amiable, largely helpless men guided along by patient interlocuters. I'm early in the script, but already it's clear that both Lynch and Frost are greatly amused by the contours of the Dougie situation and probably plan to milk it for as long as they can. Be prepared. However, this past week I also saw David Lynch: The Art Life, a riveting, meditative exploration of both his painted work and his early years. The film is fascinated by the struggle to realize oneself in a perplexing world, one in which the individual barely seems to control his or her fate and is often hampered by well-meaning friends and family. At one point, Lynch remarks that he wasn't miserable in his early married life, with bills and responsibilities piling up and his bohemian dream slowly fading. Not exactly miserable, not really, no. But if he hadn't received one particular phone call, providing the opportunity to make a film which would snowball until a decades-long career... "Well," Lynch tells us over a picture of his sadly smiling twenty-four-year-old self, "I don't know what would have happened." 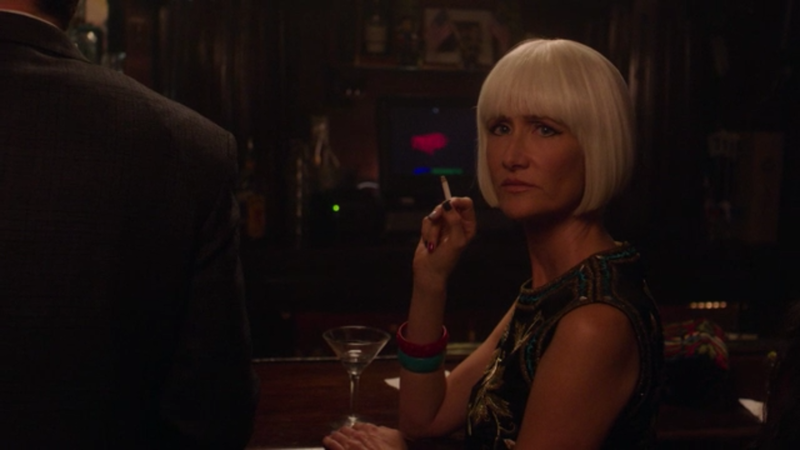 I think what is happening - and not happening - to Cooper is deeply personal for Lynch, and I suspect it is personal for Frost as well. And on a nagging, subconscious level, I'll bet it's personal for many of the viewers who feel that they don't like it. I know it feels personal for me. And I hope it takes as long as it takes to go where it needs to go...wherever that might be. David Lynch (asked by an Entertainment Weekly interviewer about Cooper returning to and reconnecting with a world he once knew): "But as you'll also see, it's also about coming into the world as a new life, and learning your likes and dislikes, and doing the best you can to find your way." Next: "There's a body all right."